w = allpass2wdf(a) accepts a vector of real allpass polynomial filter coefficients a, and returns the transformed coefficient w. w can be used with allpass filter objects such as dsp.AllpassFilter, and dsp.CoupledAllpassFilter, with Structure set to 'Wave Digital Filter'. W = allpass2wdf(A) accepts the cell array of allpass polynomial coefficient vectors A. Each cell of A holds the coefficients of a section of a cascade allpass filter. W is also a cell array, and each cell of W contains the transformed version of the coefficients in the corresponding cell of A. W can be used with allpass filter objects such as dsp.AllpassFilter and dsp.CoupledAllpassFilter, with structure set to 'Wave Digital Filter'. Create a second order allpass filter with coefficients a = [0 0.5]. Convert these coefficients into wave digital filter form using allpass2wdf. Assign the transformed coefficients to an allpass filter using the wave digital filter structure. Pass a random input to both these filters and compare the outputs. The difference between the two outputs is very small. Numeric vector of allpass filter coefficients, specified as real numbers. a can have length only equal to 1,2, and 4. When the length is 4, the first and third components must both be zero. a can be a row or a column vector. Cascade of allpass filter coefficients, specified as a cell vector. Every cell of A must contain a real vector of length 1,2, or 4. When the length is 4, the first and third components must both be zero. A can be a row or column vector of cells. Numeric vector of transformed coefficients, determined as a real number, to use with single-section allpass filter objects having Structure set to 'Wave Digital Filter'. w is always returned as a numeric row vector. Cascade of transformed allpass filter coefficients, determined as a cell array, to use with multi-section allpass filter objects having Structure set to 'Wave Digital Filter'. W is always returned as a column of cells. The allpass transfer functions H1 and H2 can also have the following alternative representations, using decoupled coefficients in vector w1 or w2 respectively. For allpass coefficients, w is often used to derive adaptor multipliers for Wave Digital Filter structures, and it is required by a number of allpass based filters in DSP System Toolbox™ when Structure is set to 'Wave Digital Filter' (e.g. dsp.AllpassFilter, and dsp.CoupledAllpassFilter). 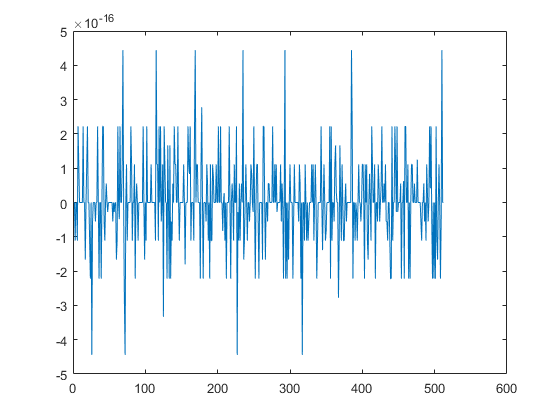 M. Lutovac, D. Tosic, B. Evans, Filter Design for Signal Processing using MATLAB and Mathematica. Prentice Hall, 2001.